You occupy the flat alone, so you will not be neither disturbed by another cohabitant nor by any cleaning personnel. You will be able to cook your meals in our good endowed kitchen. The holiday house Gobl is a non smoking house with 168 m² living space. 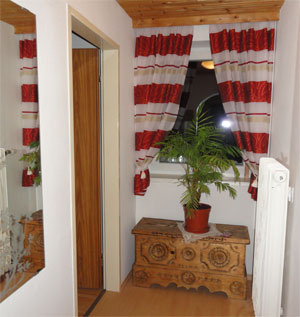 The flat has been renovated 2011 completely and as also been refurnished. There are beds for 8 persons in 3 double rooms and 2 single rooms available. If necessary there are two additional beds after request available. Heating is done with a central heating system, partially with floor heating and the whole flat has a central water heating system. On the ground floor there is a modern eat in kitchen with open roof beams. Equipment: cooker, microwave oven, dishwasher, refrigerator with freezer, fume hood, water cooker, coffee machine, and a complete dish set. 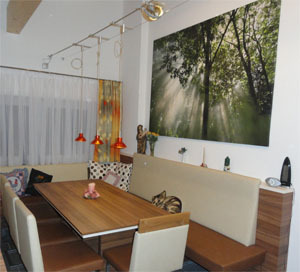 A big comfortable dinette provides place for minimum 8 – 10 persons. A big HD – TV set and a sound system are also available. An additional comfortable habitable room is the farmhouse room with a wood burning stove. A big storage room is reachable from the eat in kitchen and from the garden. It is equipped with a clothes washer, a laundry dryer, a big basin, ski storage space and a space for ski boots. 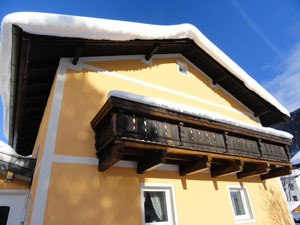 Further rooms on the ground floor are a double room with a sofa bed, a bathroom with toilet, urinal, basin and shower. In the anteroom is counterpart the coat rack a small storage room with a frame for shoes and other things of the daily live. On the first floor there are two double rooms facing south, two single rooms and a bathroom with toilet, bath tube and shower. Internet via wireless LAN is available for free. All rooms are controlled by fire alarm boxes for your security. Bed clothes, towels, bath towels and dishcloths are available. Pets are only allowed after allowance. A big garden with garden furniture is provided. The flat is in a by road and a parking area is right in front of the flat.